The location marker is placed on Püspökmolnári. 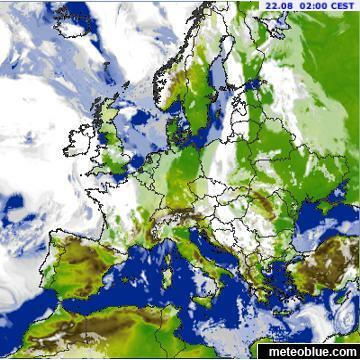 Meteosat satellite images for Europe are updated in real-time every 5 minutes. The first 4 time steps also show precipitation. Precipitation is estimated from radar and satellites. At night precipitation estimates from satellites are less accurate than during daytime. Orange crosses mark places where lightning was detected (over Europe). Copyright 2019 EUMETSAT / meteoblue. 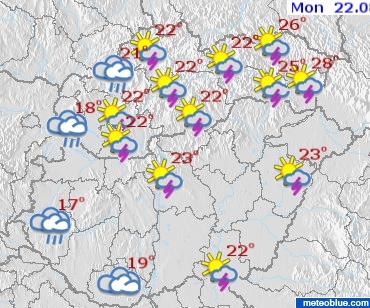 Lightning data provided by nowcast. Time delays between this website and the www.meteoalarm.eu website are possible, for the most up to date information about alert levels as published by the participating National Meteorological Services please use www.meteoalarm.eu.